As many of you know, the word "Gospel" means "good news." And, boy, do we have some good news for you. Over the years, we've recorded your favorite artists singing the gospel songs they grew up with. But the performances have been scattered across all of our many video collections. 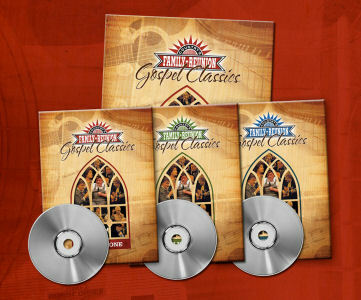 But now, we've put them all together on one incredible 3-volume DVD series, Country¹s Family Reunion Gospel Classics! The songs on this series are choice moments from Country¹s Family Reunion, Country's Family Reunion 2, Country's Family Reunion Celebration, Country's Family Reunion Gospel, Grassroots to Bluegrass Day 1, and Grassroots to Bluegrass Day 2. But the good news is, you can buy this set and get the performances, all in one series! Plus, we'll throw in the Gospel Songbook absolutely free so you can sing along with the artists as they share songs of praise. This collection comes with the Gospel Classic SongBook! Some of the performers you'll see include: Jimmy Dean, Skeeter Davis, Billy Walker, Bill Anderson, The Whites, Martha Carson, Johnny Russell and many more! !